You've probably all heard about it by now, but here's some extra information about the latest Tekken 5 upgrade, in case you didn't catch it. 1. "Eddy Gordo (formerly a 3P outfit for Christie that cost 500,000 credits to buy) is now selectable on his own"
2. "Kunimitsu is selectable as a 3P outfit for Yoshimitsu (not 100% confirmed)"
3. "Players making a comeback from Tekken 5 will also have new moves. 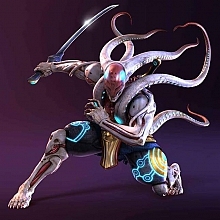 Yoshimitsu reportedly has a throw where he splits into two, tosses the opponent in the air, and impales his hapless victim." The new Yoshi throw sounds interesting, can't wait! - Tekken Official has been updated. - VGO Network has vids of Lili and Dragunov in action. I remember in Tekken 3 that Yoshimitsu had a throw similar to this. You grab them on their left and he does this mirrow throw which looks neat. Might be a different one but it fits the description. I Have heard so many great things about the new Tekken game from my friends and from a website I am part of. The select screen looks great for I seen a sample of that on the other site I am on. It will be released. Not only I'm sure of it, but I have the unofficial info "from player to player", starting in Korea. Just asking but would they also be releasing Tekken 5.1 too or just the Tekken DR one? They probably only release the Tekken DR but maybe somebody heard something about this? T5.1 is a minor upgrade. Judge by the popularity toward T5.1, it is useless to make a game that similar to T5. DR on the other hand, has more stages, more characters, new moves, and if my eyes did not deceive me, slitely better graphics. They will mostlikely come out with this game on console after VF4Evo was a successful hit. $20 bucks, heh, if they follow evo's footstep. Many do not like the Tekken 5.1 game. I just own Tekken 5 and is planiing to get Tekken 5 DR when it comes out here. How about we list the new kinds of stages in DR! I'll name a few I saw in one of the trailers. the new acid rain seems to locate at the different place. Instead of day time, it kinda look like it was at evening.